Stoner Food: Pistachio Crusted گلاب جامن....with Bacon?!? (Hindi: गुलाब जामुन, Urdu: گلاب جامن), also known as "waffle balls," a popular dessert in countries of the Indian Subcontinent such as India, Pakistan, Nepal and Bangladesh. It is made of a dough consisting mainly of milk solids (often including double cream) and flour in a sugar syrup flavored with cardamom seeds and rosewater or saffron. Waffle Balls!!? I've never heard that before. If you've ever been to a buffet at an Indian restaurant, then you've probably seen or had Gulab Jamun. They're the brown bobbing balls in a tray of syrup at the end of the line for dessert. They are served warm and almost POP in your mouth with goey, cakey, creamy innards. They are super rich and sweet and delicious. One day I thought 'What if you rolled one of these sweet Indian balls in crushed pistachios and then wrapped it in bacon?' Now, I have to admit that I am not a bacon eater, but I was trying to blow my friend and fellow stoner chef's mind. We finally got to making them last week after purchasing a can of Gulab Jamun at the local Indian market. You can make them from scratch, but we wanted to keep it easy and put our energy into the main dish we were creating. When I first thought of this, I thought it may have been an original idea. And, according to Google, it is. However, I was surprised to find that pistachios are a common garnish, and so only the bacon makes it unique. We made two varieties of the balls...one with bacon and one without. 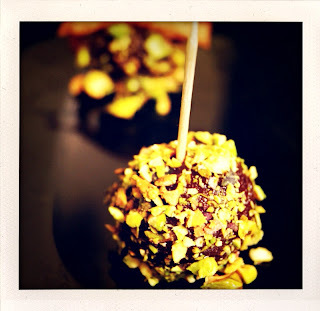 The pistachios alone rounded out the flavor and texture of the Gulab Jamun, and totally set them off. 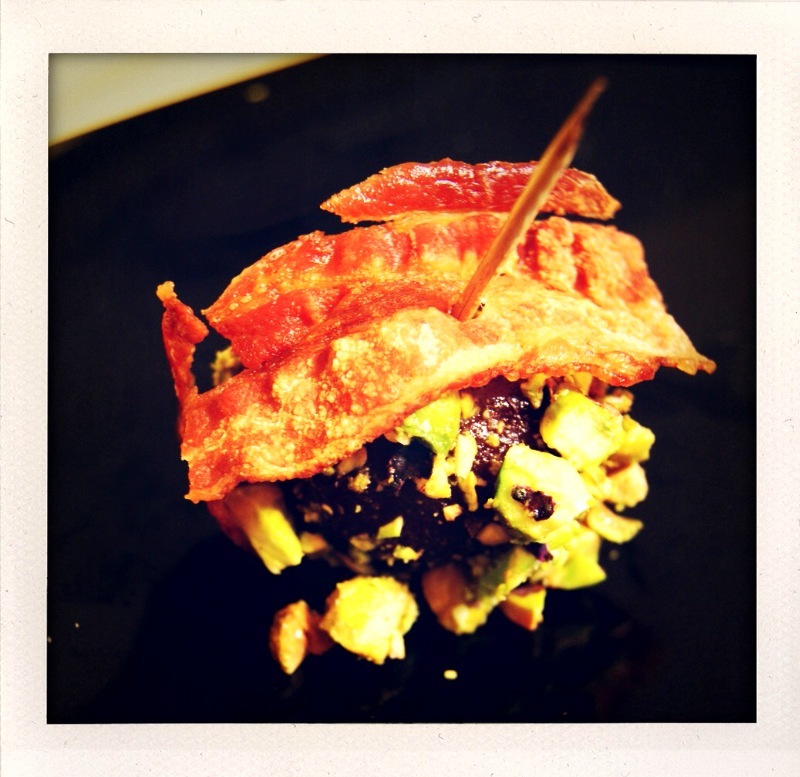 The bacon just added more richness and a contrastingly savory flavor. Fry your bacon and set aside. 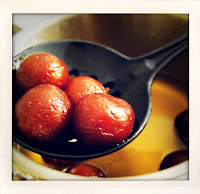 Warm Gulab Jamun and syrup in a saucepan over medium heat for ~ 10 minutes, or until they are slightly too hot to eat. Spoon the Gulab Jamun out with a slotted spoon and let some of the syrup drain. Roll balls in chopped pistachios and set on serving dish. Wrap bacon strips around Gulab Jamun and pierce all the way through with a toothpick, then set upright so the toothpick is sitting straight up and down. We offered this as a sweet finger food- an hors d'oeuvres type dish to some friends and lovers before an onslaught of additional stoner food was presented. It was a huge hit. They taste good at room temperature but are best served warm. That looks absolutely wonderful! With bacon and pistachious too! I came across your site from the foodieblogroll and I'd love to guide Foodista readers to your site. I hope you could add this Gulab Jamun widget at the end of this post so we could add you in our list of food bloggers who blogged about recipes with gulab jamun,Thanks! Had a good chuckle at the "Sweet Indian Balls" tag. I now have a great pick up line to use at the bar this evening.